My name is Janet and I have been a diabetic for 52 years (which is all my life). Back in 2003, I acquired the Personal Emergency Response Service (PERS) from Easter Seals. Before having this service, I would have diabetic episodes, unable to help myself. I live with my parents and every year when they would go on vacation, my anxiety of thinking I would be alone and not have help would actually cause a diabetic episode. Giving back to an organization that has touched your family personally is a wonderful way to keep a legacy alive. 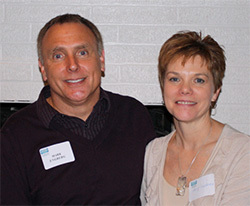 Mark Engberg's sister, Mary Beth, who lived with cerebral palsy, enjoyed many summers at Easter Seals camp. Mark realized then the impact that services provided by Easter Seals could have on people with disabilities and their families. My name is Tracy, and I am writing this letter in regards to my son Jacob. 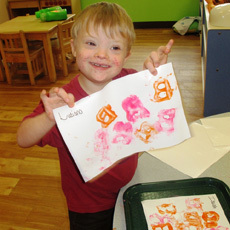 Jacob started attending Easter Seals Igoe-Amar Child Development Center when he was just 5-6 months old. Jacob has Down syndrome among other health issues regarding his heart, asthma, etc. It was very important to me that my son got the best care upon entering a daycare facility. To me, Easter Seals is not just a daycare.